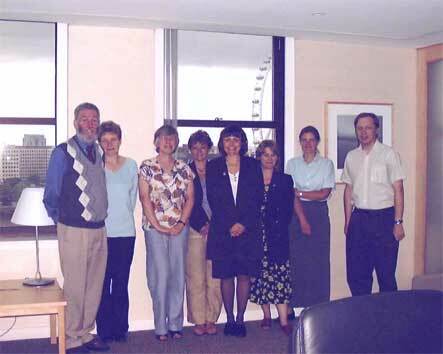 Health professionals with an interest in radioactivity were invited to an initial planning meeting of the SAGE project on 1 July 2003, at the Health Protection Agency HQ in London. This core group agreed to take on responsibility for the setting up of an extended stakeholder panel to evaluate the applicability to the UK of the radiological protection culture adopted so successfully in Belarus following the Chernobyl accident. Information on the long-term management and rehabilitation of contaminated areas in Belarus will be transferred to western European countries in the form of a handbook, the first draft of which will be available in autumn 2003. The core group of the UK stakeholder panel met in London for a second time on 11 May 2004. The main focus for discussion was the advanced draft of the handbook providing guidance for those living in the contaminated territories. The stakeholders provided their initial feedback on its structure and content as well as its general applicability to the UK. Several members of the panel agreed to convene satellite stakeholder groups (comprising members of the public, public health professionals etc.) in different areas of England and Wales to further extend the consultation process. A questionnaire designed by NRPB will be used to record feedback on specific aspects of the handbook in a standardised format, i.e.